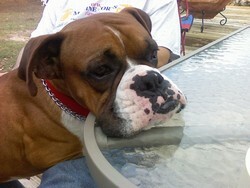 Our beloved Gunny was adopted from ABR on Veterans Day, 2006. Not a day goes by that we aren’t thankful for the smiles he has brought into our lives. We had agreed to foster a boxer because it was important that the organization not have the expense of keeping him at the vets office. This was to be a temporary situation, only a week or so. Our family was complete, we had an outdoor kitty, and a lab puppy. Didn’t want or need another pet. The moment we arrived at the vets office to pick him up, something clicked. We knew from the minute we got him in our car that he wasn’t going any where. Although neither of us voiced it at the time, we both knew that he was going to be part of our family. We often wonder what he went through before he became a part of our family, and in the first few days we would comment to each other that he was lucky we adopted him. After all he has a home, good food, love, regular health care and hygiene, but the truth is we are the lucky ones.